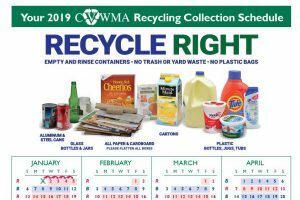 Recycle right with CVWMA. Please recycle ONLY the items described and pictured below under “Acceptable Items”. Do not put other things in your recycling container, such as those listed under “Unacceptable Items”. CVWMA contactors will be placing Oops?Sticker on recycling containers set out on collection day to show items placed in containers that we do not accept. 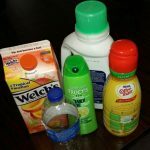 Unacceptable items will be landfilled; they may also contaminate (and make unrecyclable) the items we can recycle in this area. For information about why we allow certain items and prohibit others, please visit our FAQ. R3 and Oops! Sticker. Plastic bagged recyclables not accepted. No Need to Sort! Our residential recycling program is single stream. We don’t require materials to be sorted. However, if you prefer to keep like items together to organize and contain your recyclables between collections, that’s okay, too! 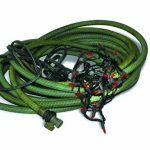 Don’t be alarmed if the items are mixed in the truck together. Everything collected by TFC Recycling will be separated at the processing facility in Chester. Recyclables collected by CFS and County Waste from cities of Hopewell and Petersburg go to the CFS Recycling Center in Petersburg. Avoid sticker shock. CVWMA contractors are now using Oops! stickers to show unaccepted items. 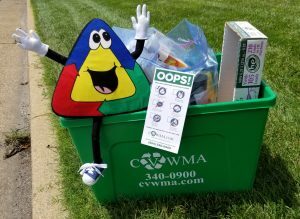 Recycle right with CVWMA. Accepted items include aluminum and steel cans, glass bottles and jars, mixed paper and cardboard, plastic bottles, jugs, tubs and containers with a #1-#7 on bottom, plastic lids and caps (rinsed and free of food residue and placed back on bottle or carton, not loose), and food and beverage cartons such as milk, juice and egg substitutes are recyclable in our residential recycling (curbside) and drop-off recycling programs in our participating member localities. 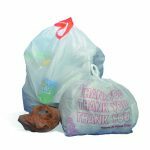 Remember that plastic bags, plastic bagged recyclables, Styrofoam, and food contaminated items are not accepted. 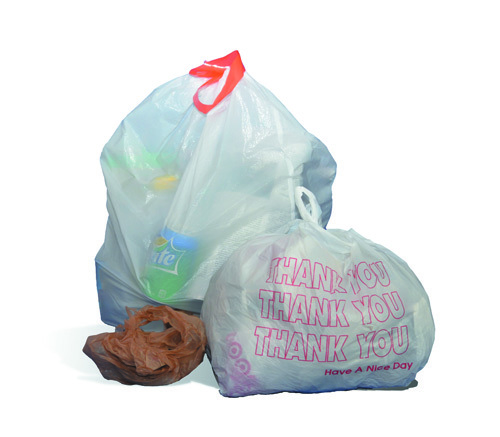 Please do not bag your recyclables in plastic bags and place bagged recyclables in your recycling container. Plastic bags damage the sorting equipment at the material recovery facility (MRF). If you use plastic bags, please recycle at local retail stores. Watch our educational Journey to the MRF video. See what really happens at a local Material Recovery Facility. Local Impacts to changing Global Recycling Markets. We must clean up our act! Recycle Right! says Kim Hynes, Executive Director, CVWMA. Here’s why. Corrugated cardboard boxes- please flatten. Watch our educational Journey to the MRF video. Newspaper, magazines,catalogs, computer paper, junk mail, cereal and other paperboard boxes and paper bags. Watch our educational Journey to the MRF video.No shredded paper. Donate to local animal shelter or use in composting. 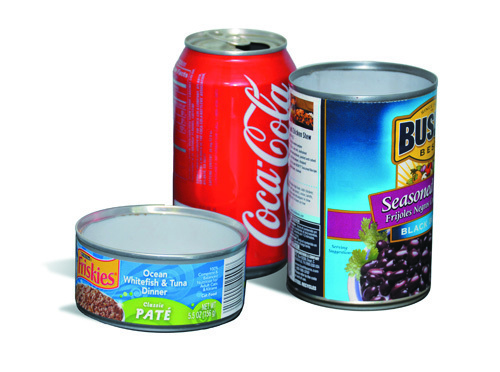 Metal cans, including food and beverage cans. Lids can be recycled too.Empty and rinse. Place the lid back in the can. Watch our educational Journey to the MRF video. 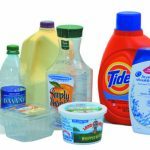 Plastic bottles and containers such as milk and juice jugs, soda & water bottles, shampoo bottles; detergent bottles, butter tubs, yogurt or sour cream containers, clear clamshells, berry baskets, prescription bottles, etc. 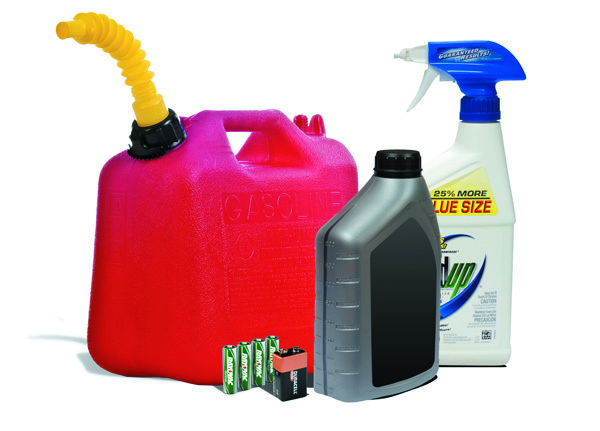 Empty, rinse, and replace cap before placing in your recycling container. 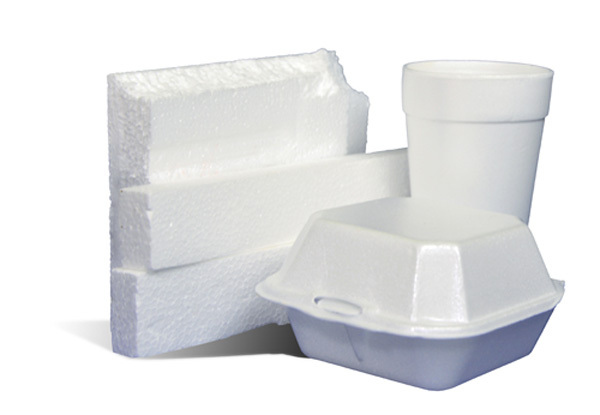 Remember, Styrofoam containers/packaging are still not accepted. 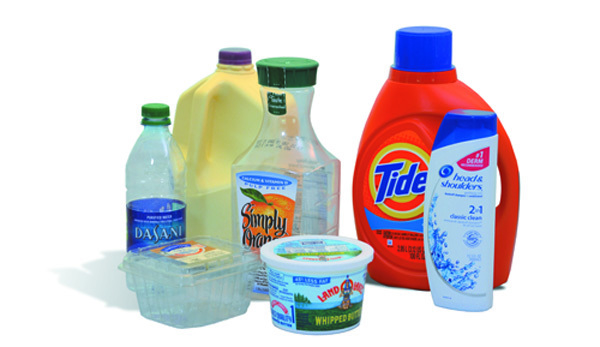 We do not accept motor oil plastic bottles either.Watch our educational Journey to the MRF video. Clear, blue,brown & green food & beverage glass containers. Empty and rinse. 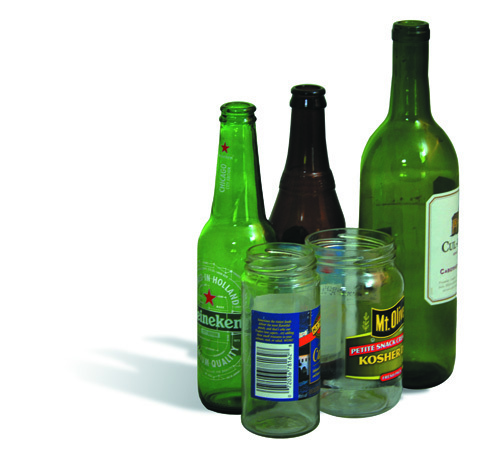 Remove and throw away metal caps/lids from accepted bottles or jars before putting them in the recycling container. Metal lids are not accepted. Watch our educational Journey to the MRF video. 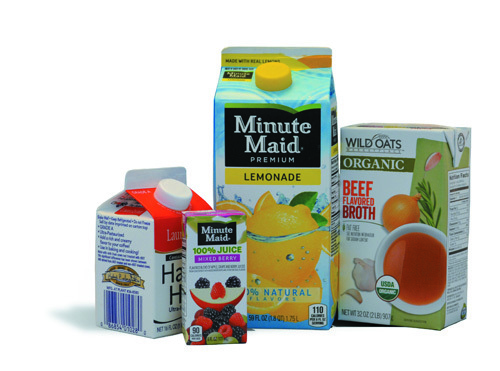 Food and beverage cartons such as milk, juice, soup, creamers. Empty, rinse, and replace plastic caps before placing in your recycling container. 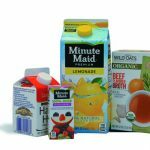 Here is a short video by the Carton Council on what new products that recycled cartons can be made into. Plastic lids and caps are accepted. The cap needs to be placed back on the bottle or carton after rinsing to be recycled. 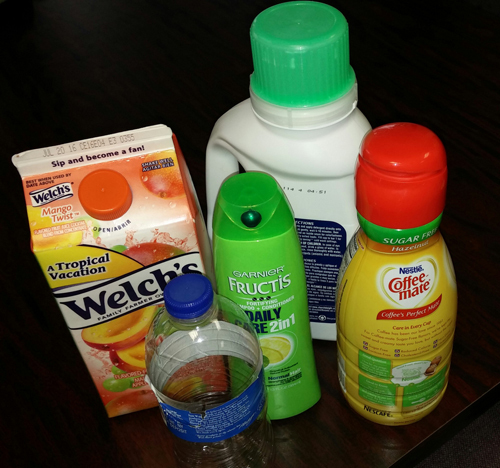 Remove lids from accepted bottles or jars and rinse and replace cap before putting them in the recycling container. No loose bags of caps are accepted. The cap needs to be placed back on the bottle or carton to be recycled. Watch our educational Journey to the MRF video. Please DO NOT include the items below. 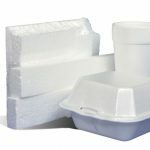 Including cups, carryout packaging, and packaging materials (like peanuts). Watch our educational Journey to the MRF video.CVWMA contractors will be placing Oops! sticker on recycling containers that include unaccepted items. NO PLASTIC BAGS. No plastic bagged recyclables. Do not bag recyclables in plastic bags. They will not be opened and recycled at the MRF. 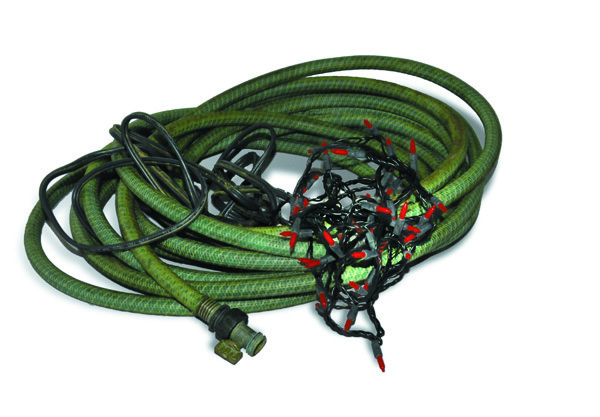 Plastic bags can cause equipment damage at the processing facility (MRF) when they get wrapped around moving parts. Return plastic bags and film to retail stores. Recycle at local retail stores . CVWMA contractors will be placing Oops! sticker on recycling containers that include unaccepted items. Such as pizza boxes or aluminum foil. 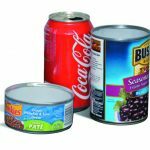 Any food left on your containers may attract pests to your recycling bin. Food residue also contaminates the materials and make them unrecyclable. Watch our educational Journey to the MRF video. CVWMA contractors will be placing Oops! sticker on recycling containers that include unaccepted items. 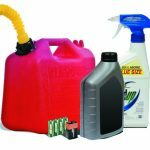 No flammables, motor oil, paint, or batteries are accepted. CVWMA contractors will be placing Oops! sticker on recycling containers that include unaccepted items. No hoses, wires, chains or electronics are accepted. We do not accept holiday tree lights. CVWMA contractors will be placing Oops! sticker on recycling containers that include unaccepted items. 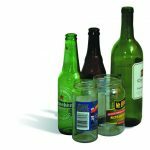 Remove and throw away metal caps/lids from accepted bottles or jars before putting them in the recycling container. Watch our educational Journey to the MRF video. No shredded paper. Donate to local animal shelter or use in composting. Recycle at home? Recycling not collected? 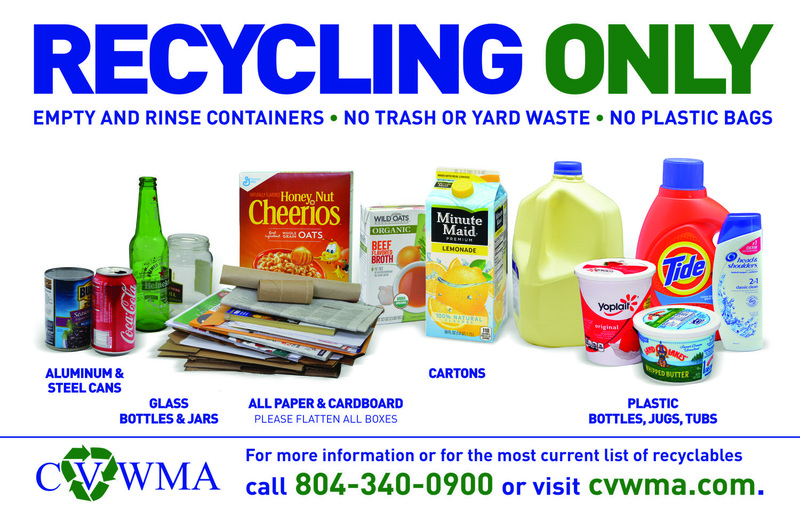 Call CVWMA at (804) 340-0900 to speak with one of our customer service representatives for recycling assistance. Please do not email or post a missed collection on social media as Staff cannot provide online assistance.